North Korea suddenly making nice for the duration of next month’s Olympic Games in South Korea, putting seven decades of enmity on hold for 16 days with its offers to send athletes and entertainers across their heavily militarized border, won’t fundamentally change what happens next. When the Olympic flame has been extinguished, North Korean leader Kim Jong Un will continue to use every tool at his disposal, including his gulags and thought police, to maintain his iron grip on power, demanding unfailing loyalty from each and every North Korean, just as his grandfather and father did before him. To preserve the dynasty they handed down, one where the Kims and their trusted lieutenants ruled across decades when millions starved, he will continue the North’s push for an arsenal of nuclear-tipped missiles that could strike faraway cities — to make sure that world leaders think thrice about any scheme to topple him. So, when the medals have all been won, the world will almost certainly find itself back at square one: Worrying again about whether Kim and U.S. President Donald Trump are just a misstep or an angry tweet away from reaching for those nuclear buttons they’ve bragged about. Because North Korea has been so closed for so long, trying to determine the intentions of Kim Il Sung, Kim Jong Il and now Kim Jong Un has often been an exercise in guesswork. But it’s safe to say they all shared the same priority: the survival of themselves and their regime. Kim’s unexpected offer earlier this month to send a delegation to the games in Pyeongchang must be seen through that lens. From his perspective, an Olympic truce is a low-risk gambit that helps the No. 1 purpose of his regime: buying more time for Kim. Having no part at all in the Feb. 9-25 games just 80 kilometers (50 miles) south of the heavily mined border that divides the Korean peninsula would have been worse for Kim. It would have made the North appear even more isolated, not only targeted by U.S.-led international sanctions but cut off from the far more forgiving sporting world, too. That takes some doing. 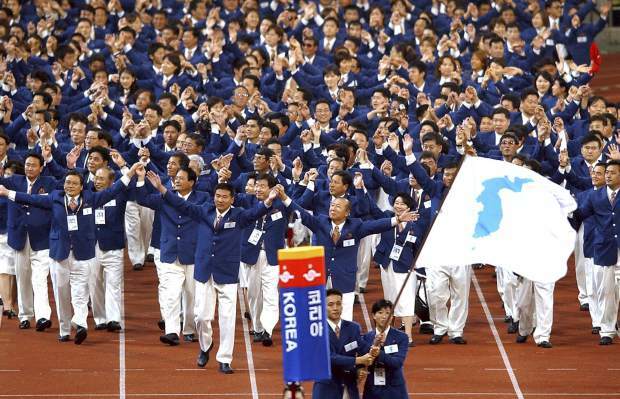 Instead, by sending singers, dancers, an orchestra and a cheering squad, the North gets to whoop it up at the South’s Olympic party, ditches its pariah costume for a couple of weeks, and temporarily confuses and distracts the world from its stated goal of perfecting and growing its nuclear arsenal. Not a bad trade-off. The few athletes the North is likely to send will almost certainly return home empty-handed. But Kim can lean on his mouthpieces in the North’s entirely state-controlled media to pen fawning paeans anyway. In sports, North Korea barely makes a dent, despite Kim’s supposed love of the NBA and occasional visits from Dennis Rodman. But Kim has favored winter sports, and one of his big showcase projects — a ski resort three hours outside Pyongyang — attests to that. The South, for its part, would have looked churlish by refusing Kim’s outstretched hand, even as he holds missiles in the other one. Should this thaw, like previous ones, again fail to produce a broader, more enduring melt of frosty ties between the Koreas, it should at least reassure Olympic athletes and visitors that they won’t be risking their lives by putting themselves within range of Kim’s troops. The International Olympic Committee stands to gain from this, too. Before the Koreas started talking again, Russia was shaping up as the dark cloud over the first Winter Olympics since its armada of doped athletes, helped by state officials and a lab director later turned whistleblower, topped the medal table in Sochi in 2014, only to lose that spot when medals were later stripped. IOC President Thomas Bach will still face tough questions in Pyeongchang about why Russian athletes are being allowed to compete again so soon after the Sochi scandal. But thanks to the Koreas, he’ll also be able to crow that the Olympics are a force for human cooperation, even peace. Kim, for one, would like us to believe it — however true or untrue the reality might be.